The vacuum bell has come a ong way since it's beginning. Newer designs and techniques are beginning to become accepted into the surgical community. 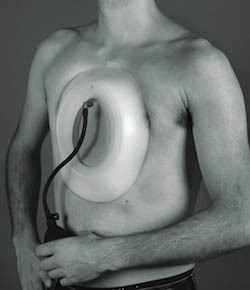 The idea of the vacuum bell is to pull the dented chest cavity outwards. This is done by placing a large vacuum bell over the dent and pumping the air out. If done for one hour over 2 years, a mild exacavaum can be pulled out - and possibly forever.